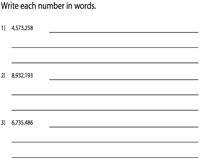 This array of large number worksheets follows right after the number names of thousands. 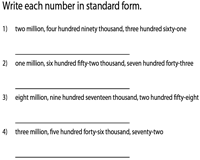 Teachers and parents may assist children with a place value table to practice these worksheets as they will need to write the appropriate number names or numerals in 7-digits, 8-digits or 9-digits. These worksheets are sure to widen their understanding of the concept of place values in millions. Guide students in writing the correct number names for 7-digit (millions), 8-digit (ten millions) and 9-digit (hundred millions) numbers. You may use the place value table to help kids grasp this concept better. This assorted range of worksheets will reinforce the concept of writing number names in millions. Use the answer key to verify the responses. 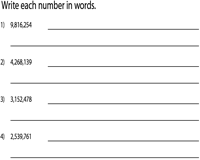 This set of worksheets requires children to read each number name and represent them in number form. 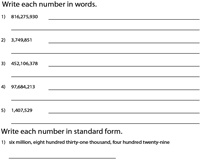 These large number worksheets have been split into three levels to facilitate easy downloads. 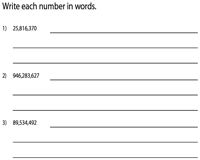 Each worksheet contains an assortment of number names in millions. Help kids represent them in numbers. Free worksheet is included. 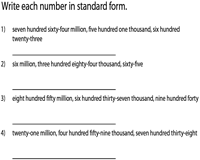 Interpret number names as numerals and vice-versa for this array of worksheets that have been organized into three levels to include millions (7-digit), ten millions (8-digit) and hundred millions (9-digit). Our combined review worksheets form a great tool to help track a child's learning progress in writing number names and numerals in millions.